The City of Copenhagen is currently working on some small but important changes on our cityscape that will make things a bit easier for the city's cyclists. There is a network of one-way streets in the city - both the city centre and the surrounding neighbourhoods - which is mostly directed at motorised traffic. In some instances the one-way restriction applies to bicycles. Not that it means much. Bicycles regularly follow these desire lines. The City is now tidying up and legitimising bicycle traffic in the opposite direction down one-way streets. This is, of course, the norm in many bicycle-friendly cities. It's not just bicycle bridges and massive intersection redesign that make the city better for cyclists. Often a simple sign or a small piece of bicycle lane can make things better for cyclists. Over the next couple of weeks the Traffic Dept. will be putting up new signs and and performing minor changes to the street markings in 10 different spots in the city so it becomes legal to ride down a one-way street. "It's in the details that we find the key to becoming the world's best bicycle city. 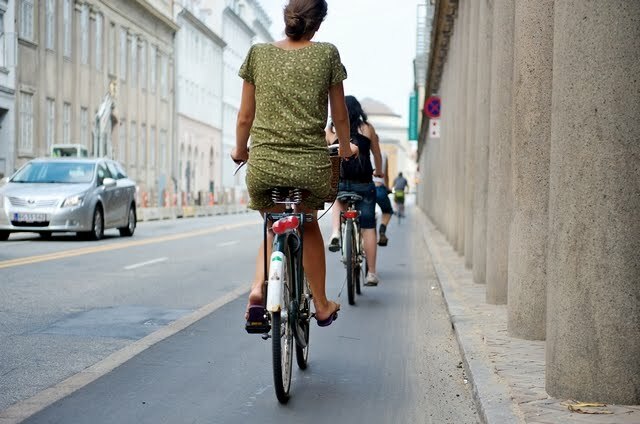 Therefore even the smallest changes are important and we have been listening to the city's experts on the subject - the thousands and thousands of Copenhagners who wear their tires thin riding around the city", says Mayor of the Technical and Environmental Department, Bo Asmus Kjeldgaard. The Traffic dept constantly recieves ideas from cyclists about how the city can become better for bicycle transport. As a result, The City has done an analysis of 50 spots where small changes can make a big difference." Interestingly, The UK Dept. of Transport is expected to alter their signage rules to allow for this "Cyclists excepted" rule, according to the London Cycling Campaign. After the intial 10 spots with minor changes, the Traffic Dept. will start work on the larger projects that require more work than alterations of street markings. The City of Copenhagen has also issued a press release regarding what was one of the missing links in the City's bicycle network. The street Stormgade, above, in a rather extreme situation, but hey. It's a narrow street with quite a lot of traffic but there was previously no separated bicycle lanes on it. Cyclists were forced to ride in traffic on one side and share a bus lane on the other. It isn't a long stretch of street, but it was far from optimal. 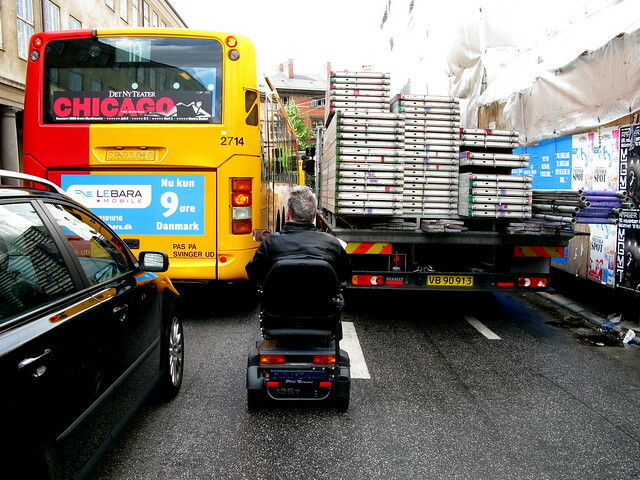 In fact, according to the City of Copenhagen's "tryghed" index (sense of security), Stormgade had an incredibly low score from the city's cyclists. It was at 3.3 out of ten. Stormgade in summer, 2010. Photo courtesy of the City of Copenhagen. Now, at long last, the City has built separated lanes on both sides of the street. As a result, the citizens now give it a 'sense of security' index rating of 7.7. One of the highest ratings in the city. Cyclists now feel safer - and are safer. Whenever the City builds new bicycle infrastructure on a stretch of road there is an increase of 20% in the number of cyclists and 10% fewer cars. The Mayor in charge of the Traffic Dept., Bo Asmus Kjeldgaard says, "It's great to learn that the new bicycle lanes on Stormgade live up to the intentions. Stormgade has for too long been a black mark on our bicycle net. It isn't anymore and cyclists appreciate it because it makes them feel safer. I look forward to the next bicycle counts from the street because I'm sure they will show an increase in cyclists."